Around the Bay is a 30km race run annually in Hamilton in late March. It is the oldest race in North America, and is celebrating its 125th anniversary. For this race, it was around -1C to 5C and felt colder because of the wind. Being the first race of the year (and a long one at that! ), I felt gloriously under prepared and anxious to get to the start line. Deciding what to wear was definitely a challenge, the weather was mild enough to break out the summer gear; however, upon waking up there was an inch of snow covering the grounds (Grr! Friday’s 17C was such a tease!) , so I erred on the side of caution wearing weatherized shoes and wind gear. Enjoy the Running Expo. For previous races, I was usually rushed through the Expo by a non-runner who is eager to get on with the day instead of looking through all the shops and races on display. For this one, I was accompanied by 3 fellow run addicts who were eager to look at potential races to sign up for, medals on display, new gels, and cute running shirts. It definitely sets a much different tone going into a race, when you’ve been surrounded by people who are as excited as you are. Running gear can make or break your race. While I was kept warm, my winter shoes are quite well loved, and are nearing the end of their running career. Realizing this in the middle of a long distance race, was not fun to say the least. Running a race on shoes that had lost their support and made my feet extremely conscious of the blisters that were forming reinforced the concept – good footwear is paramount. Hill Training is Critical. When I mentioned to others that I was thinking of doing this race, I was warned that at the end of the race there would be a giant hill, and at the end of said hill there would be a grim reaper waving hello – he was there, and it was awesome. “We run hills, all the time. It won’t be that bad” I naively thought. What they didn’t warn me about was the series of hills leading up to that hill. The course covered a number of overpasses and small streets which covered totaled apx 200m of elevation, and by the time that I got to THE hill (which is around the 26km), my body was definitely cursing at me. During the regular season, we regularly run intervals and hills, so I was grateful for the hours that I had put in grinding to build up stamina. Run your own race! Going in I had a plan – go out slow, keep a steady pace, and don’t stop on hills. This was immediately thrown out the window, when I saw someone who seemed to be keeping a similar pace to me, and my new idea was to keep pace with the “man in the blue hat”. So running up hills I would look for the hat, going through water stations, I would look for the hat, and when I was feeling like I was going too slowly, I would look for the hat. This worked splendidly for the first 10km, and then I realized that Mr. Blue Hat had increased his speed by at least 15 seconds a kilometer, and that I was now pushing much harder than I should be so early in the race. So I fell back, and kept with the original plan. Having support can really help get you through. For this race, close to 35 people I knew had come out to run and cheer. Seeing them on the course jumping up and down, and encouraging me to go forward was honestly what kept me going at some points, especially near the end after getting up that hill. Apart from my own friends, there were a number of citizens out to spur on runners, offering tissues, fruits and high fives (super important for much needed energy boosts). For this race in particular, there was the option to run it as a 2 person relay, or a 3 person relay, so while on the course, you’d see groups gathered at the 10km, 15m and 20km points waiting to transition. Suddenly seeing a group of people ready to run at these points definitely kept moral up. Lastly, volunteers make the race, so thank you to all the volunteers! The course was set up with a number of water stations, and volunteers were cheerful (or at least they seemed it) and were always ready and prepared to hand out water or Gatorade to runners. This was especially important, because I often missed kilometer markers and wouldn’t have hydrated properly if there weren’t so many pit stops along the way. All in all, it was a great start to the year, and I can’t wait till the next race! Great review Tracey! I loved when I ran this race. 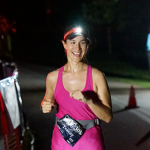 Great advice on running your own race and bringing the right gear.